Today’s guest blogger needs no introduction. Joel Spolsky one of the best bloggers out there. He also runs one of our portfolio companies, Stack. And his approach to management is unorthodox at times but amazingly effective. I asked him to tell us a little about how he does it. I think you’ll enjoy this post, it’s great advice on many levels, and its is also full of chuckles. I told you he’s a great blogger. Very few company founders start out with management experience, so they tend to make it up as they go along. Sometimes they try to reinvent management from first principles. More often than not, they manage their startups the way that they’ve seen management work on TV and in movies. 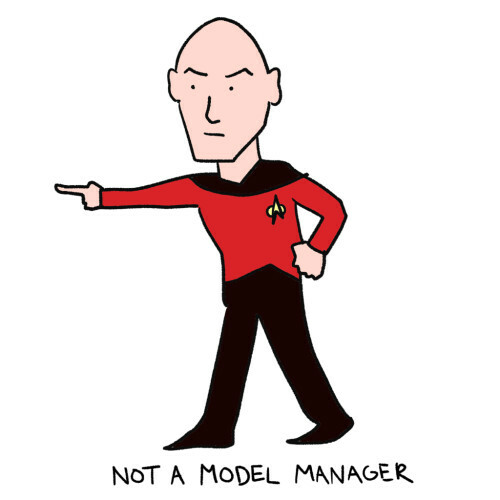 I’ll bet more entrepreneurs model their behavior on Captain Picard from Star Trek than any nonfiction human. Most TV management is of the “command and control” variety. The CEO makes a decision, and tells his lieutenants. They convey this important decision to the teams, who execute on the CEO’s decision. It’s top-down management. All authority and power and decisions flow from the top. How could it work any other way? This system probably works very well when you are trying to organize a team of manual laborers with interchangeable skills to sweep up the ticker tape in the street after the Giants parade BECAUSE THE GIANTS WON THE SUPER BOWL IF YOU DID NOT NOTICE. Command and Control probably worked great in the toothpaste factory where Charlie Bucket’s father screwed the little caps on tubes. This system is also pretty obvious, so it’s what 90% of startup founders try first. Seductively, it even works OK for a three person company. This is dangerous because you don’t notice that it’s not going to scale. And when the company grows from 3 to 30, top-down management doesn’t work, because it doesn’t take advantage of everyone’s brains in the organization. Turns out, it’s positively de-motivating to work for a company where your job is just to shut up and take orders. In tech startup land, we all understand instinctively that we have to hire super smart people, but we forget that we then have to organize the workforce so that those people can use their brains 24/7. The “management team” isn’t the “decision making” team. It’s a support function. You may want to call them administration instead of management, which will keep them from getting too big for their britches. Universities are a disgusting model to follow, unless your business model is funded by the federal government–without regard for performance. I don’t understand why everything always has to be flipped upside down. What was good is now bad, weak is strong, sin is virtue…. and the underdog always wins…we get it. Steve Jobs wasn’t JUST a dictator. He was a dictator that formed a flat organization of competing business units full of smart people that he very much trusted and admired. He demanded the most out of them and they RESPECTED the hell out of him. Love stack, and I get the idea behind this (trust smart people)….just not a fan of diminishing the importance of leadership, vision and passion. Believe it or not…people still want to be inspired. This article was originally written by Joel Spolsky and Fred Wilson on February 13, 2012 here.